That’s about the most dissention you’ll hear in the ranks of these undergraduates from Elk River, Minnesota. When asked which of them competes in the toughest athletic event, all three point to Brittany, the graduating senior. “Breaststroke is like 90 percent legs,” she explains. Brandon swims a variety of events including butterfly, and Brianna’s a diver who just added the 3-meter event to her 1-meter springboard specialty. 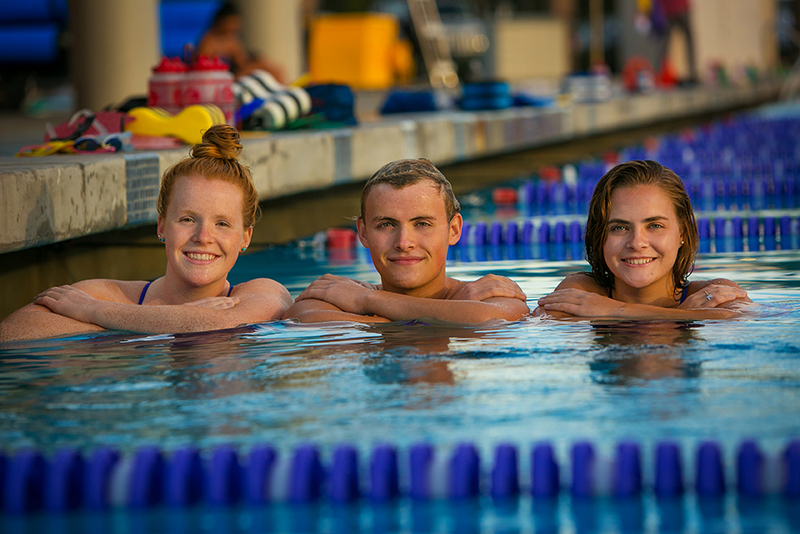 The twins, who are freshmen, followed their older sister to Cal Lutheran because of small classes and academics. “Swimming is just something that I had the opportunity to do, and I’ve really enjoyed it so far. I’ve had lifetime bests already,” said Brandon, who majors in exercise science. Brittany and Brianna are history pedagogy majors preparing for careers as secondary school teachers. Brittany might stay on at Cal Lutheran if she chooses the Graduate School of Education for her teaching credential and master’s degree. “My career goal is to be teaching abroad for five to 10 years, if not longer, and then come back to the United States and share all of my knowledge and experience,” she said. The three are not the first in their family at Cal Lutheran, a distinction that belongs to a cousin, Jeremy Swenson ’11.